päivämäärä Maaliskuu 29, 2017, 2 a.m. There is still little sign of any “Bregret”. There is a media appetite for a narrative of the public changing their mind and some newspaper stories based on open-access voodoo polls or cherry-picking individual polls, but the broad picture is consistent: the vast majority of people still think the way they voted in June 2016 was correct. YouGov has regularly asked if people think that Britain was right or wrong to vote for Brexit in 2016. 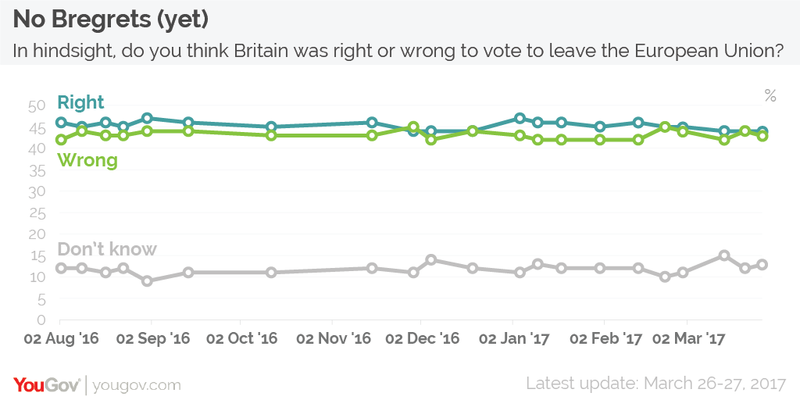 These figures have actually narrowed a little in recent weeks, but that still leaves the public evenly split between those who think it was right for Britain to vote for Brexit (44%) and those who think it was wrong (43%) . The narrowing is largely because those who didn’t vote in 2016 tend to split in favour of Remain – people changing their minds largely cancel each other out. Once likelihood to vote is factored in, this suggests that if there was a second referendum tomorrow the result would probably be much the same as it was last year. While support split 52%-48% in favour of leaving at the referendum, support for now going ahead with Brexit is significantly higher. More people who voted to Remain last year take the view that the government has a duty to follow the result and leave the EU than think they should try to reverse it. 48% of people say they are confident in Theresa May’s ability to negotiate a good deal from the EU, 39% are not. Theresa May’s government enjoys a large and solid lead in the polls and her personal approval ratings are strong. In terms of public confidence, the government are entering negotiations on a high. Asked specifically about the negotiating process only a third (33%) of people think the government are doing well at negotiating Brexit, while slightly more (37%) think they are doing badly. This may just be because actual negotiations haven’t begun yet – when people are asked about the speed of Brexit 35% think the government has been moving too slowly compared to 20% who think it has moved too fast and 27% who think the pace is about right. This confidence is not necessarily entirely positive for May. High expectations mean she has a lot to live up to. If the public don’t realise how difficult the challenge facing the government is then they may turn sharply against the Prime Minister if things don’t go as planned. A large majority think that it is important that Britain retains access to the single market after we leave the European Union. It would, however, be wrong to necessarily interpret this as a public appetite for Britain staying within the single market through an EFTA type relationship. Polls also consistently show that people think it is important that Britain has full control over immigration once we leave the European Union, something that is normally seen as being incompatible with single market membership. The public would like to have their cake and to eat it. When asked a direct question on which they would choose - 16% said control of immigration, 24% said free trade with Europe, but 40% said it was a false choice and Britain could have both. It looks like they will be disappointed. When we asked the 40% what they would prefer if they were forced to choose, they split evenly between immigration and trade. Combine those who questions together and it means more people are concerned about trade than immigration, but either way, getting one without the other is going to disappoint some voters who think it should be possible to deliver both. Asking about the individual parts of Brexit is probably the wrong way to do it. The public won’t get to pick an a la carte Brexit, they will be presented with a Brexit deal by the government and will, presumably, either think it is a good or bad deal for Britain. Prior to Theresa May’s speech in January we polled people about different potential versions of Brexit. Only 35% of people thought a “Norway-type” with Britain remaining part of EFTA would be good for the UK. A “hard Brexit” on WTO terms was even more unpopular, with only 32% thinking it was good for the country. The most popular approach was a “Canada-type” model, of Britain leaving the single market but negotiating a new free trade deal with the European Union. 50% thought this would be good. Our most recent polling on Theresa May’s actual proposals for Brexit find 52% think it would be good for Britain – suggesting she’s has done a good job at pitching her negotiating aims at a point where the public will support them. By 61% to 11% people think May’s version of Brexit would respect the referendum result, half (49%) say they would be personally happy with it, a quarter (25%) unhappy. Once negotiations are complete 45% of people say that the government should go ahead and implement Brexit without any extra vote. 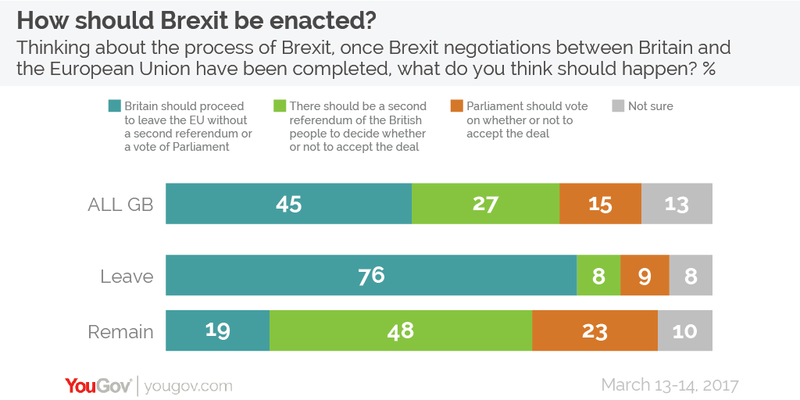 15% think that Parliament should vote on whether or not to accept the deal, 27% that there should be a requirement to approve a second referendum. As one might expect, this is strongly correlated with how people voted last June. A large majority (76%) of Leave voters think the government should depart the EU with no additional approvals after negotiations are complete. A smaller proportion of Remain voters (48%) would like a second referendum. In her January speech Theresa May said that “no deal was better than a bad deal” and by 48% to 17% the public say they agree. 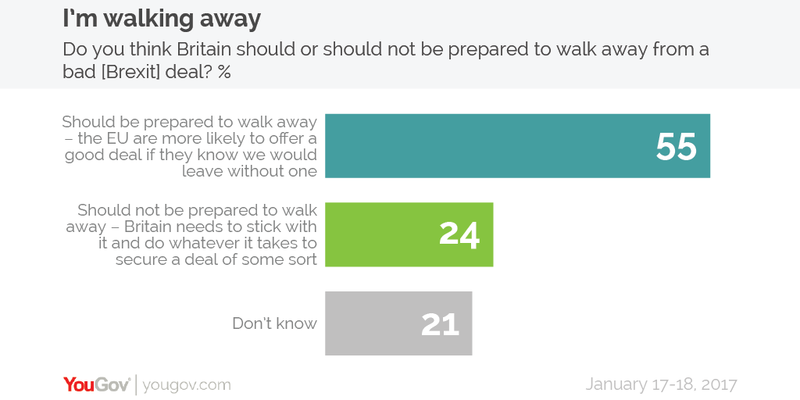 55% said Britain should be prepared to walk away without a deal compared to 24% who think we should do whether it takes to get a deal. 8. How would people react if May’s deal can’t be delivered? It appears that the public would support Theresa May’s intended version of Brexit, but that leads to the question of how they would react to a deal that fell short of this. Suddenly public opinion would become much less clear. We asked about people’s reaction to a far less advantageous version of Brexit (the sort of deal one imagines could happen if negotiations go badly). 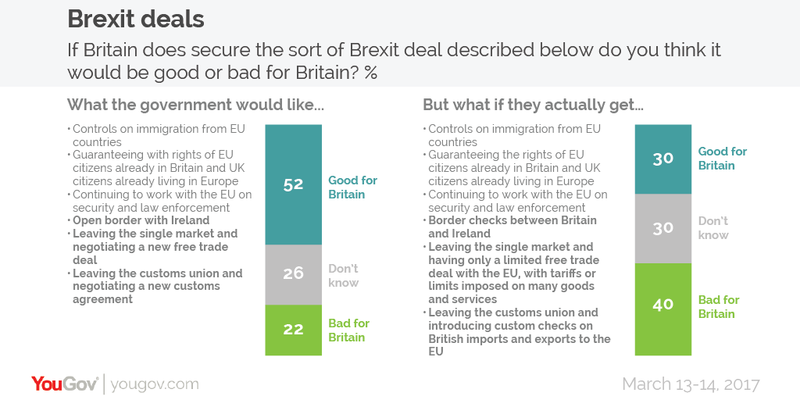 Only 30% think a deal where Britain leaves the Customs Union and Single Market and faces customs checks and tariffs would be good for the country. Three in ten (30%) say they would like the government to go back and seek to renegotiate if it came away with such a deal. If there was no chance of any further renegotiation 41% of people would want to go ahead with Brexit even on these terms, 32% would like a second referendum, 27% wouldn’t be sure. As Article 50 is invoked Theresa May and the government have a public goodwill behind them, but face an extremely difficult path. 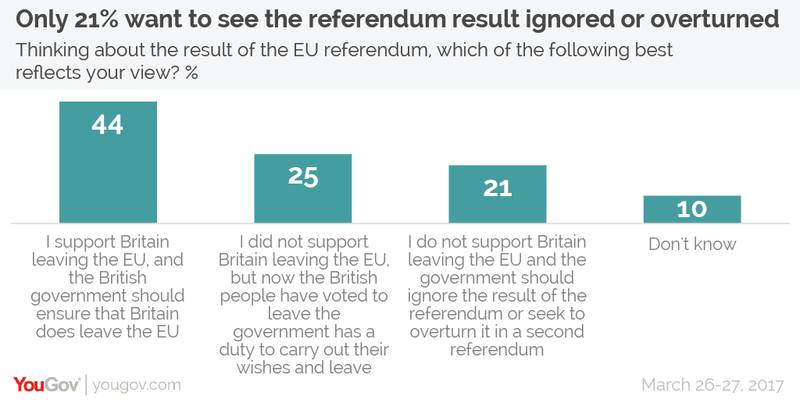 Most people either actively support Brexit or think the government is obliged to carry it out and there is currently little support for extra votes or extra referendums -they would just like the government to get on with it. However, public expectations are very high. People would like both the benefits of Brexit and the benefits of EU membership and a substantial proportion think this is both possible and are confident in Theresa May’s ability to deliver. The version of Brexit that the set out in January met with the approval of most people. 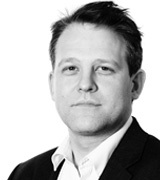 The problem for May is very soon those high expectations and ambitious targets will meet with the reality of the actual negotiations and the compromises that are almost inevitable. At that point we will begin to see how robust public support for Brexit and confidence in Theresa May really are. 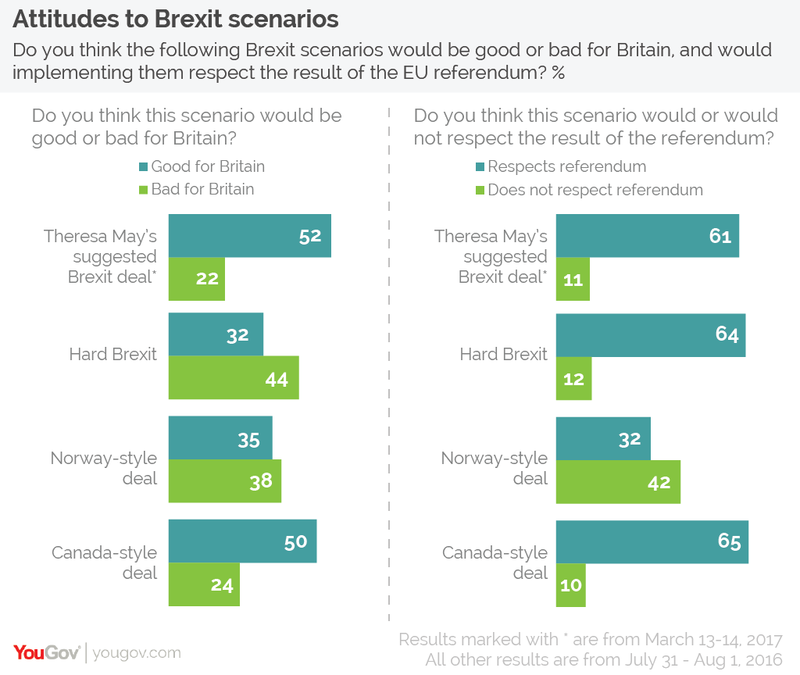 Hypothetical questions asked in advance suggest the public agree that “no deal is better than a bad deal” and think Britain should leave the EU even if the deal does fall short of their expectations. Many people are unsure though, and if negotiations do go badly people may be less firm in their opinions than they care to admit to either pollsters or to themselves.